Congratulations: you made it to graduate school and are pursuing your dream career of being an occupational therapist! Now that you are in grad school, things are different than undergrad. You are likely in a small cohort of around 30 people, with a few faculty members who teach all of your classes. These faculty members are key to your success. They serve as teachers, mentors, and guides on the journey of becoming an occupational therapist. For this reason, it's important to know a few basic principles on how to create a good relationship with the faculty at your school. Knowing how to communicate with faculty — and how it's different from how you interacted with your professors as an undergraduate — is key to fostering these relationships. There are four crucial aspects to communicating with faculty as a grad student: they're experts in your field, you have to be proactive about getting to know them, your fieldwork coordinator is extremely important, and you must learn to accept constructive criticism with grace. During the undergraduate years, it is common to have zero individual conversations with your teacher. There are likely a couple teachers from your undergraduate studies with whom you developed a meaningful relationship, but for the most part, students try to blend into the mass of other students in the class. Well, grad school is different. Your teachers probably know your name on the first day of school. They chose you to come to your program. They are passionate about raising the next generation of their beloved profession. They care if you do not pass. This may sound scary, but it’s a good thing. You also chose to pursue their profession. You chose their program. You want to be there. This creates a much different dynamic than during your undergraduate years. You already have common ground and common goals. You can take a deep breath and relax. You have people on your side who want you to succeed. Although you may feel like you are the busiest human in the world when you are in school, it is your job to make the effort to cultivate a relationship with your faculty. Many professors have an open door policy, which means you can stop in and speak with them without an appointment. Do this. It may feel awkward to stop in, but believe it or not, they want to get to know you. They will be happy if you stop in. You may have a natural question come to mind from a lecture, or you can simply say that you enjoyed the lecture they gave. After having an initial conversation with your professors, it will become easier to drop in and have day-to-day conversations. Things will flow more naturally and like all good things, the relationship will take time to create and require effort on your part. It is important to get to know your fieldwork coordinator, and it is also important to facilitate them getting to know you. Depending on how your school makes the arrangements for fieldwork, this person is crucial to matching you to a good fieldwork educator and clinical setting to set you up for success. The better your fieldwork coordinator knows you, the better of a match they can find for your rotations. Make an effort to stop by the office and say hello; get to know their story and why they love occupational therapy. 4. So, what happens if there is a difference of opinion? It is crucial to develop these skills as a person and a future professional. As students, we must be sensitive to the fact that the professors are the leaders for now. It is important to avoid “yes but, ____” responses, and sometimes we may have to accept their answer even if we do not like it. One more thing: everybody has bad days, even the faculty, so give your teachers a break if they seem stressed. They have lives outside of school as well, along with families, and stressors. So accept that they are humans and do your best to work through disagreements. Feedback is the process of giving and receiving ‘constructive criticism.’ It may be a suggestion from a teacher or it may be something as drastic as your fieldwork educator telling you that you need to make a major adjustment in order to pass fieldwork. The basic point is that it is hard to be told you need to change, and also hard to make it happen, all the while being positive and pleasant. In my program it seems like feedback is talked about over and over again. This is because it is SO IMPORTANT. As students and new professionals, we will be working with people who have more experience than us. While this may be intimidating, it should be viewed as a learning experience. A chance to absorb the knowledge of those nearby and collaborate. This means that as the student or new grad, it is your job to let people know that you want the feedback. Then, it is your job to graciously accept it and not take it personally if people give you constructive criticism or do not like your ideas. The process of giving and receiving feedback will be crucial during school, fieldwork, professional work, and life in general. Relationships with professors in graduate school are very different than during undergraduate years. Be proactive with your relationships with faculty. 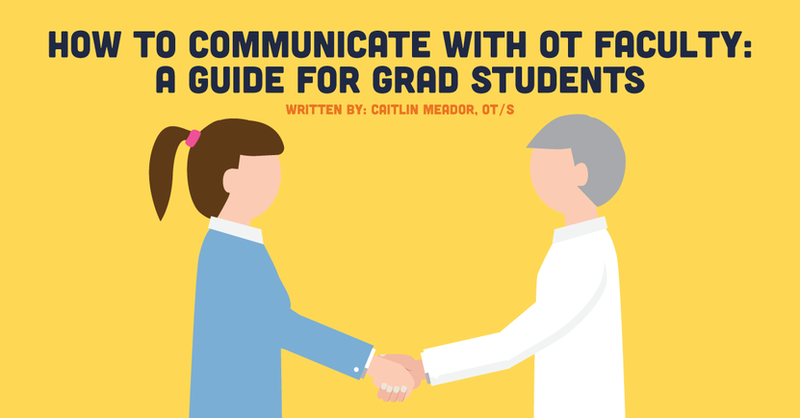 Even though it can be difficult, forming relationships with the faculty during occupational therapy school is a skill worth developing. While in school, the faculty are key to success. They are there to help make your dream of becoming the best occupational therapist you can be come true! What are some of your own strategies to develop a relationship with the faculty at your school? We’d love to hear about it in the comments below!